The giant mural painted by Italian street artist Blu in Buenos Aires featuring thousands of figures with their eyes covered by one endless blindfold in the colours of the Argentine flag was vandalised this week. 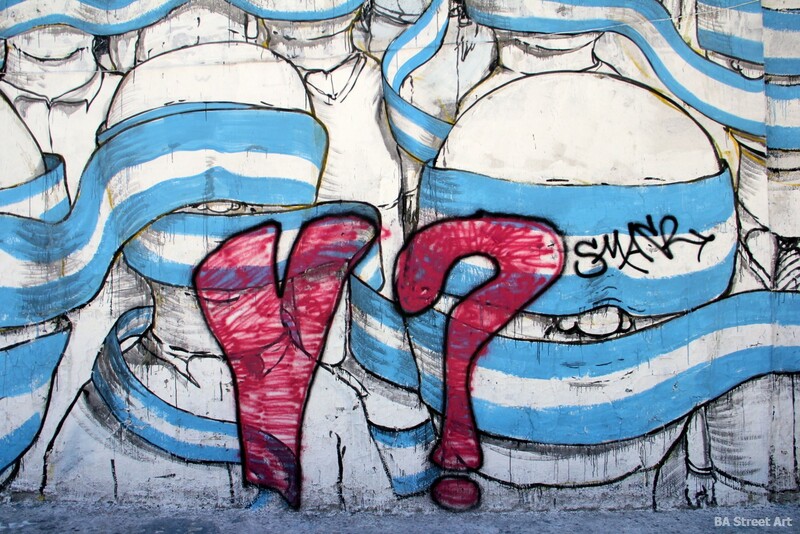 Someone has written the Spanish word “Y” meaning ‘And’ with a question mark after it over two of Blu’s figures. 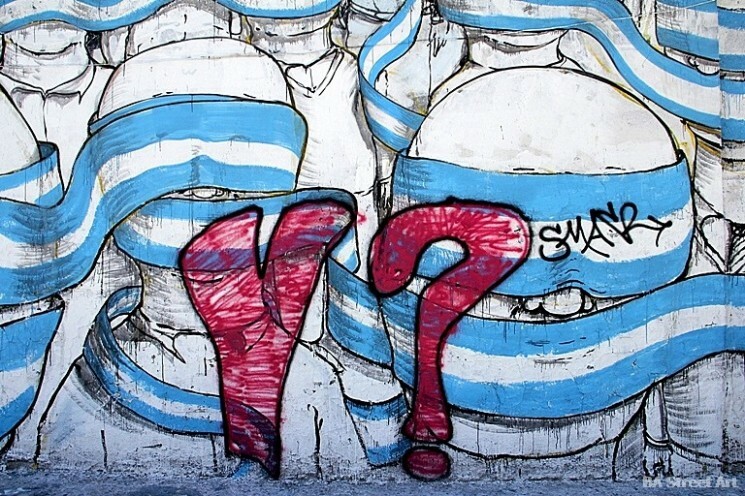 A number of Argentines have taken offence and interpreted Blu’s artwork as depicting the electorate as ‘blind followers’ following Cristina Fernandéz de Kirchner’s convincing presidential victory in October. 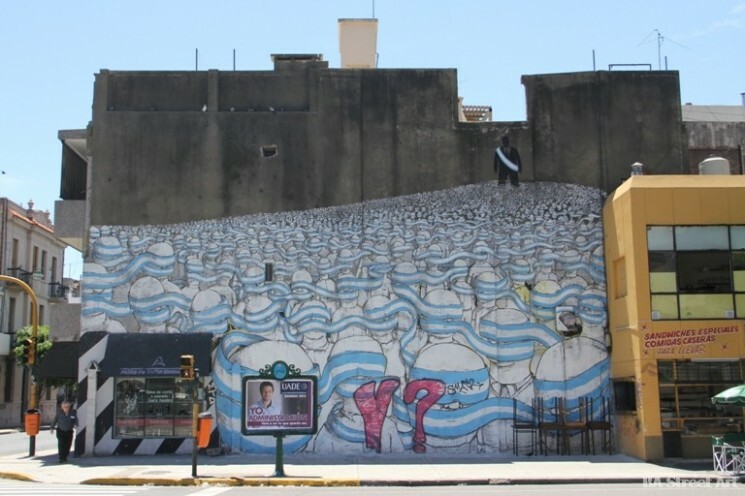 Despite Blu pointing out that if you are not in Argentina you can change the colour of the flag (in the mural) depending which country you are in, someone has still decided to deface the artwork. Buenos Aires Street Art thinks art should provoke debate, discussion and opinions both positive and negative. Like Banksy, it’s great that Blu has the guts to tackle edgy and often controversial topics and make political commentary in his art. Of course some people might not like what Blu has to say but there is no need to damage what in our opinion is one of the best pieces of street art in 2011 by one of most-talented street artists in the world. Please let us know what you think. 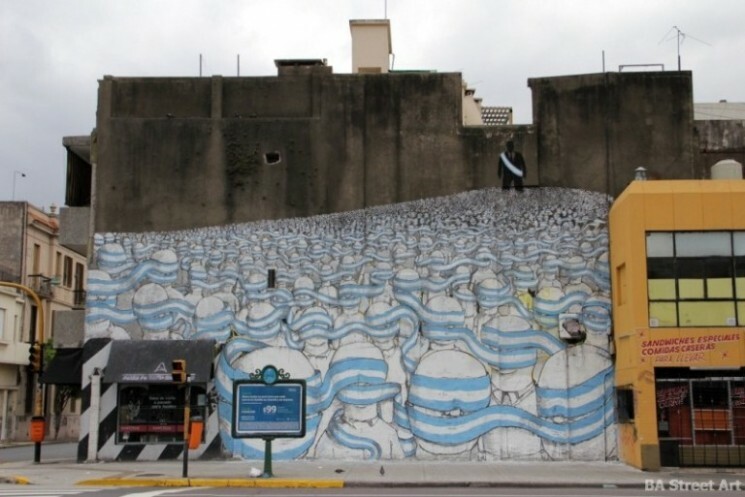 This entry was posted by admin in News and tagged blu, Blu banderas mural, Blu Buenos Aires, Blu mural, Blu street art. It must have been a blind nationalistic hater without any intellectual approach to art, politics or society. This is the way these kind of people handle critics. They can not tolerate other perspectives and opinion and want to rease everything that differs. Poor little, ignorant ego-minded hater without heart nor mind. ‘Y?’ demands that the artist and viewer propose a solution. ‘Y?’ is a testament to the nerve struck with a conscious audience. BLU challenges the viewer to acknowledge truth, and be set free. ‘Y?’ confirms that his message was received. Before the truth can set you free, it will piss you off.